Organizer for notes, news, clippings, email, addresses, contacts, and more. 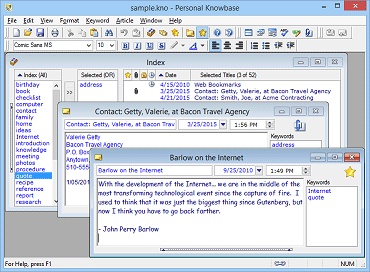 Personal Knowbase is a freeform keyword-based PIM (personal information manager) for Windows. It makes organizing a large amount of data easy by using a natural way to retrieve notes, using keywords to filter for related information. Do you need to organize the information in your life? Reduce paper clutter by entering your notes in your computer instead of piling them on your desk. Save time accessing stored records quickly by just selecting a relevant keyword or two. Manage large numbers of entries as easily as a few. No limits on number or length of records. Carry your notes with you by installing on a portable USB drive. Password-protect your information for privacy. With Personal Knowbase, you can be an information packrat. Never worry about forgetting an important detail once you've organized it in the software. Clear your head. Capture your notes with Personal Knowbase. Because of Personal Knowbase's flexible, freeform structure, you can use it to organize many types of data. Or, you can keep specialized files for storing single types of data. “I have used a number of information management programs over the years, including Folio Views, MyInfo, Debrief, TreePad and OneNote, to name a few. You can see that (1) I believe in managing information in a database as opposed to a hard drive and (2) that I'm on a quest for the perfect information management tool. I am profoundly impressed with the thoughtfulness of your design, the robustness of the software and the ease of use - not to mention its incredible power. Even putting all my information into your product has been made easy by your very adaptable import function - just brilliant. Plus I have info all over the place and in several would-be information manager-type progs; it is all going into your program. Get Personal Knowbase Freeform PIM Today! Carry your notes with you to use them on any Windows PC. Run Personal Knowbase from a USB drive.